In town for GABF week? We’ve got something special for you – a very limited quantity of the first ever Port/Bourbon Double Barrel-Aged incarnation of Ten FIDY Imperial Stout. 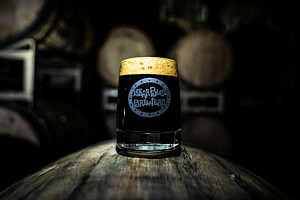 Port/Bourbon Double Barrel-Aged Ten FIDY Imperial Stout (13.3% ABV) Ten FIDY Imperial Stout gestated for nine months in a bourbon barrel; then was cradled in the warm embrace of tawny port barrels until it got straight-up portly with grape, vanilla, milk chocolate, and berry flavors with a hint of coconut. Give this Port/Bourbon Double-Barrel Aged Ten FIDY a shot ONLY in Colorado Taprooms. Note: If you’re thinking, “wait, wtf is a tawny port?” here is the gist: Grapes from the Douro Valley in Portugal go into making port wine, which is generally enjoyed as a dessert wine. When aged in wooden casks, gradual oxidation and evaporation turn port wine to a mellow, golden-brown (tawny) color with a nutty flavor. If you’re thinking, “wait, wtf is Ten FIDY?” then you seriously need to come visit us and get corrupted with huge, malty, viscous Imperial Stout flavor ASAP.